Harlequinade is a British comic theatrical genre, defined by the Oxford English Dictionary as "that part of a pantomime in which the harlequin and clown play the principal parts". It developed in England between the 17th and mid-19th centuries. It was originally a slapstick adaptation or variant of the Commedia dell'arte, which originated in Italy and reached its apogee there in the 16th and 17th centuries. The story of the Harlequinade revolves around a comic incident in the lives of its five main characters: Harlequin, who loves Columbine; Columbine's greedy and foolish father Pantaloon (evolved from the character Pantalone), who tries to separate the lovers in league with the mischievous Clown; and the servant, Pierrot, usually involving chaotic chase scenes with a bumbling policeman. Columbine (Colombina in Italian) is a lovely woman who has caught the eye of Harlequin. In the original Commedia dell'arte she was variously portrayed as a Pantaloon's daughter or servant. In the English harlequinade she is always Pantaloon's daughter or ward. Her role usually centres on her romantic interest in Harlequin, and her costume often includes the cap and apron of a serving girl, though (unlike the other players) not a mask. 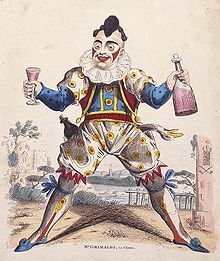 Pierrot (Pedroline) was a comic servant character, often Pantaloon's servant. His face was whitened with flour. During the 17th century, the character was increasingly portrayed as stupid and awkward, a country bumpkin with oversized clothes. 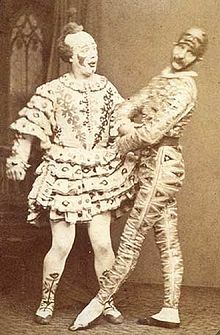 During the 19th century, the Pierrot character became less comic, and more sentimental and romantic, as his hopeless adoration for Columbine was emphasized. Also in the 19th century, Pierrot troupes arose, with all the performers in whiteface and baggy white costumes. Although the original Commedia dell'arte characters inspired many stage works, novels and short stories, there were fewer works that drew on the characters of the English tradition. They include Harlequin and Mother Goose, or The Golden Egg (1806) by Thomas John Dibdin and Harlequin and the Fairy's Dilemma (1904) by W. S. Gilbert. ^ Rees, Terence (1964). Thespis – A Gilbert & Sullivan Enigma. London: Dillon's University Bookshop. p. 16. OCLC 650490931. ^ The leading character Canio in the opera Pagliacci is costumed and made up on the lines of the Commedia dell'arte Pierrot. Chaffee, Judith and Olly Crick (2015). The Routledge Companion to Commedia dell'Arte. Routledge. ISBN 978-0-415-74506-2. Neville, Giles (1980). Incidents In the Life of Joseph Grimaldi. London: Jonathan Cape Ltd. ISBN 978-0-224-01869-2. Smith, Winifred (1964). The Commedia dell'Arte. New York: Benjamin Blom, Inc.